The Marginal Way in Ogunquit, Maine gets our top position for New England walks. It probably helps that we don’t live very far from this trail, but if you do some research, you’ll find that it is indeed a destination worth your time. The Marginal Way is a mile-long trail that starts at downtown Ogunquit’s main street—Shore Road—and ends at the docks of Perkins Cove, a small resort community bordering Ogunquit. There’s typically ample parking near the Ogunquit Police Station and you’ll find the trail head near the hotel Sparhawk—one of the most prestigious hotels in Ogunquit. Even though the trail lacks adequate signage, you can typically “follow the crowd” and you’ll end up on the trail with a view of the nearby beaches and cliffs. As soon as you start making your way along the coast, you’ll realize by the smiles of passerbys that you’ve wandered onto something special. The grassy knolls that ring the grand hotels, the wide and expansive sandy beaches that extend to the horizon and the craggy cliffs and coves that litter the trail from one end to the other. This trail is quintessential coastal Maine and the smell of ocean salt only reinforces the sense that every new turn of the trail makes the walk well worth the effort. If you have some time, make sure you visit Perkins Cove where you’ll find some great ice cream options, restaurants and tourist shops. The moderate, mostly flat Lincoln Woods Trail follows along New Hampshire’s Pemigewasset River. It’s a great option for novice or expert hikers, making it one of the more popular trails in the White Mountains. While there’s plenty of natural beauty (including a waterfall), the trail also features a wooden foot bridge. Directions: Four miles East of Lincoln on Kancamagus Highway. The trail follows an abandoned railroad grade. It start at the Pemigewasset River suspension foot bridge. The trail system includes the Lincoln Woods Trail, Pine Island Trail, East Side Trail, Osseo Trail, River View Loop, Pemigewasset Wilderness, Flume Slide Trail, Black Pond Trail, Franconia Brook Trail, the Wilderness Trail, Cedar Brook Trail, Lincoln Brook Trail, Bondcliff Trail, and many other connecting trails. The Franconia Brook Campsite is located on the East Side Trail. This popular swimming hole becomes an ice up hole in the winter. In the summer, you’ll find some of the best swimming holes in New England (see video below). It’s a short walk to Diana’s Baths from the parking lot, but hikers should come equipped with the proper footwear since it’s a bit rocky. Directions: There is a large parking lot at the entrance to the hiking path and a self service pay station which requires visitors to purchase and display a daily pass on the dashboard your vehicle. This daily pass (currently $3.00 per day) may be used at other national Forrest sites as well. Dogs are allowed along the trails, but owners must clean-up after their pets. For more photos and a detailed review of Diana’s Bath, read New England Today Travel’s review. No list of walks in New England would be complete without a reference to the Cliff Walk in Newport, Rhode Island. This National Recreation Trail runs for 3.5 miles along some of the most beautiful coastline in all of New England. Much of it goes through the property on which many of the Newport mansions are situated. The Newport Cliff Walk is a combination of paved, easy to navigate paths and unpaved rocky areas through which it isn’t so easy to traverse. Be careful as you navigate the trail as there are drops over 70 feet in some places. The beginning (at 1st Beach and Memorial Boulevard-seen below) is the easiest part because it is paved and is the most recently renovated area. The last portion (from Ledge Road to the end at Reject’s Beach and Bellevue Avenue) is the toughest to navigate. Check out the Newport Discovery guide for more information. Directions: We recommend you start at the 40 steps area (199 Naragansett Ave.), although the map above provides some other solid options. This is hike is much more than just a New England walk, I would suggest it deserves bucket list status for those who love the outdoors and national parks. This is particularly true if you’re a morning person–as in really early in the morning. Since Cadillac Mountain is located so far north and sits on the coast where the sun can be seen rising over the ocean, a morning hike to the top of Cadillac Mountain between May and October allows one to witness the sunrise first–before anyone else in the U.S. If you’re a little crazy and willing to make the hike from the base, there are several options that will take you to the peak. Keep in mind that during the summer months, you simply drive to the top with your car (until the road closes in November). And, don’t forget to spend some time biking on the historic carriage trails that spread out across the park. Directions: At the summit is a large parking lot, restrooms, and even a gift shop. A leisurely stroll along the paved Cadillac Summit Loop Trail offers wonderful views of the surrounding areas. The mostly bare granite rock of the North Ridge of Cadillac Mountain offers hikers spectacular views in all directions. There really isn’t anything like it. 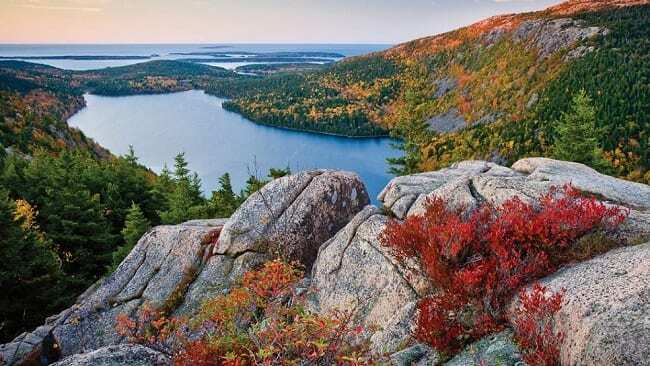 From the dazzling blue of Eagle Lake to the west, to the village of Bar Harbor and the islands offshore to the north, to Dorr Mountain in the east, hikers can spin in each direction while on the Cadillac North Ridge Trail and take in the mind-numbing beauty. 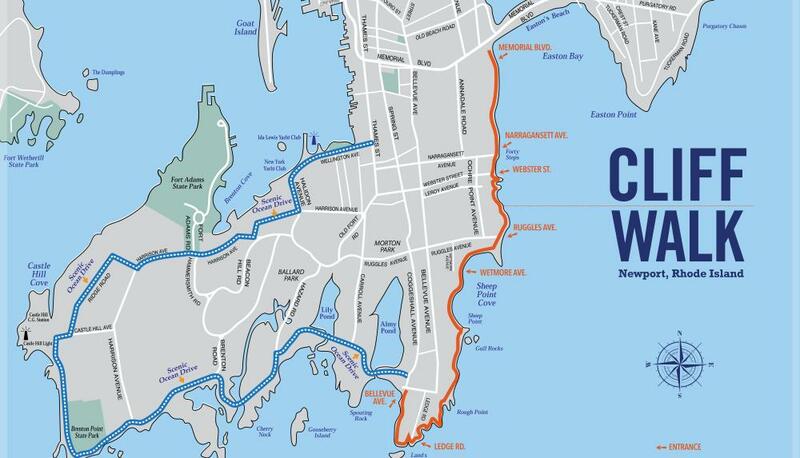 If you’re looking for coastal bike paths, spend a few minutes to read about these New England cycling destinations on the coast. You can also learn more about recommended water bottles and tips about car camping if you’re planning on visiting overnight.